A US based Healthcare software solutions company that offers professionally managed and scientifically-based wellness programs. The client’s solution is a complex product and needs to comply with various standards in the healthcare domain. We needed to understand these standards while testing the product. The data of doctors, nurses, patients etc. stored in the dashboards needed to be validated and data synchronization from any third party tool had to be verified. Extensive testing had to be done to ensure the adequacy, quality and security before opening to users. 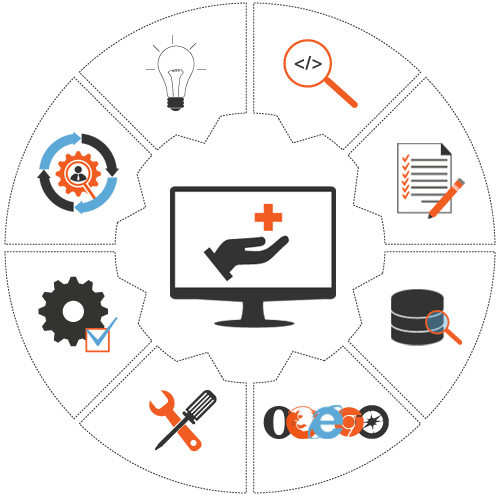 The scope of testing and maintenance of Healthcare Solutions tends to be huge. Testing automation was used to meet this challenge. We also conducted Functional Testing, GUI Testing, Database Testing and Cross-Browser Testing. We followed a customized strategy and flexible approach, starting with a detailed study of the client. This led to the creation of a testing plan, including use of automation that guaranteed better scalability, resource optimization, and compatibility. We focused on delivering high quality QA services that could meet challenging project schedules, and ensured the reliability, security, and completeness of the solution. The client is extremely satisfied with the high quality, cost effectiveness and speed of the QA testing services, which reduced the pressure on their development team and business operations. We developed the necessary domain expertise in healthcare to design the right QA strategy at every stage.